A 200-acre tract of land in the Evergreen Valley Foothills in San Jose is the reason voters are being asked to decide on two dueling measures in the upcoming June primary election. Roz Plater reports. A 200-acre tract of land in the Evergreen Valley Foothills in San Jose is the reason voters are being asked to decide on two dueling measures in the upcoming June primary election. Measure B is backed by developers who want to build housing in the area that would start around $800,000 and affordable rental units earmarked for veterans. "Up to 910 units for seniors 55 and over and 182 units for veterans," said campaign coordinator Andy Benkert. "There is a housing crisis … this is actually more affordable units than the city requires." 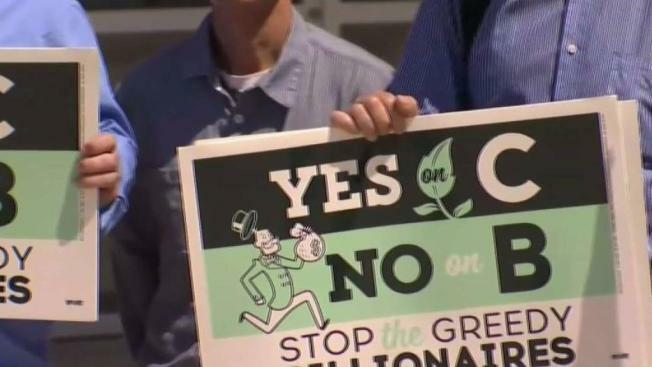 However, to do that, voters would have to approve a change in the zoning and that’s where Measure C comes in, backed by a coalition including San Jose Mayor Sam Liccardo, several city council members and environmental groups. "For decades our community has said this is not where we want sprawl and development," Liccardo said. Backers of Measure C say the number of homes would make traffic congestion in the area just off Highway 101 even worse and it would violate the city plan already in place. "Of course we need more housing," said San Jose resident and supporter of Measure C, Lan Diep. "No one will argue that point, but we need thoughtful planning." Diep said that the city has a general plan through the year 2040 and if it passes, Measure B would subvert it. "If it passes it provides every developer that wants to destroy our environment in these outlying areas of our city," Liccardo said. If Measure C passes, it would cancel Measure B.